To meet ever-increasing demand for basic library services, library supporters put Measure 17-79 on the May 16, 2017 ballot. The ballot measure to form a smaller, noncontiguous library district passed by 52 to 47 percent. This smaller district will provide a foundation of stable funding for the future and be completely independent of county government. Stable funding will allow for more hours and better materials. The new Josephine Community Library District (JCLD) will be governed and operated by the elected library district board. The district board members are Beecher Ellison, John Harelson, Jennifer Roberts, Laurel Samson, and Judy Williams. Although the district was officially formed on June 14, 2017, the new governmental entity will not receive its first tax receipts until about mid-November. Click one of the following to see questions and answers about the Josephine Community Library District approved by voters on the May 16, 2017 ballot. What happens now that voters have approved the library district? Who’s in charge of the library district and the tax funding? What are the boundaries of the new library district? How much does the library district cost? How can I help or get more information? 1. What is a library special district? A library special district is a municipal corporation—similar to a school district or our local Josephine County 4-H District. It’s an independent public entity—independent of county government. All library taxes will go only to the library for library services—not to county government. With the new Josephine Community Library District, there are now 27 library districts in Oregon. 2. Why wasn’t the library district on my ballot? Only voters living inside the district boundaries were eligible to vote on Measure 17-79 to form the library district. Only those inside the boundaries will be taxed and therefore don’t pay the annual library card fee. Property owners outside the boundaries can opt in to the district if they choose. 3. When will this library district expire and we vote on it again? The library district does not expire, and voters will not have to approve it again. A special district, unlike a levy, is a permanent funding solution. By contrast, levies are temporary in nature, returning as needed to the voters every few years. A levy and its tax dollars must be administered by a local government entity like the Board of County Commissioners. Having a library district instead of a levy ensures that the taxes collected go to the library district to be used only for libraries rather than for other county business. In addition, as a district, the libraries are administered by the library district board rather than the county commissioners. 4. When does the new library district start? The new library district was formed on June 14, 2017 when the election was certified and the Board of County Commissioners ordered that the library district be formed. However, the library district does not start receiving tax receipts until mid-November 2017. There will be about a six-month transition period during which the nonprofit organization Josephine Community Libraries, Inc. (JCLI) gradually hands off management and operations to Josephine Community Library District (JCLD). 5. When will my library card expire? Although the new library district was officially formed on June 14, 2017, there will be a transition period. The JCLI library cards will continue to be honored until at least December 31, 2017. There will likely be a grace period, and this will be decided by the library district board. 6. What improvements can I expect now that library district is approved? Increased hours (a gradual phased-in increase from the current 59.5 hours to 80 to 100 hours per week across the four library branches) to help meet the growing demand for library services. More convenient hours, including weekends and evenings. Enough money to buy new books to satisfy the ever-increasing requests for expanded and updated collections of books, DVDs, CDs, and digital library resources and services. Staff to provide technical and research assistance, with volunteer support. 7. When will the libraries increase their hours? Hours are not likely to change until sometime in 2018. The library district needs to increase staff and train more volunteers to handle the increased hours. 8. What will happen with staff? The library district board is meeting and making decisions about policy, budget, and staffing. The library district board has expressed a commitment to maintaining the vibrant culture and well-run operations that the nonprofit Josephine Community Libraries, Inc. has built. 9. Will you still use volunteers in the library? The projected district budget was built assuming the ongoing contribution of labor and expertise of the generous library volunteers, without whom Josephine County would currently have no library system whatsoever. In the 2015-16 fiscal year, library volunteers worked 27,280 hours for an average of 2,273 hours monthly, equating to 13 full-time equivalent employees and saving operations $620,620 annually. This is based on the 2015 Oregon volunteer hourly valuation of $22.75 per hour (Independent Sector). Under the preliminary district budget in the Josephine Community Library District Economic Feasibility Statement, the same (or possibly a higher) level of library volunteer effort will be needed. 10. Will employees of the library district become part of the Public Employees Retirement System (PERS)? While library districts in Oregon are eligible to have their employees on PERS, they are not required to do so. Other library districts in Oregon have opted to set up 403(b) retirement plans for their employees. After the district is formed, the new board will decide on the employee benefits program. 11. Will the name of the library system change? After the transition period, the library system name will change from Josephine Community Libraries, Inc. (JCLI) to Josephine Community Library District (JCLD). 12. Will SOLIS or some other form of interlibrary lending return? Probably not in the near future. There is currently no interlibrary lending system in place that Josephine Community Library District could join; a new system would have to be formed in cooperation with neighboring library systems. who’s in charge of the library district? 13. Who runs the library district? Voters elected five library district board members in the May 16 election. These new board members are Beecher Ellison, John Harelson, Jennifer Roberts, Laurel Samson, and Judy Williams. This board oversees library operations. The board members are volunteers and receive no financial compensation for their service. Learn more about the library district board. 14. When does the library district board meet? Library district board meetings are governed by public meeting law. Therefore, all regular district board meetings will be announced and open to the public. Meetings started in July, and the public is encouraged to participate. Learn more about library district meetings. 15. How will funds collected for the library district be used? All money will be used exclusively for essential services within the community library system. Such services include books, subscriptions, information technology, supplies, utilities, janitorial, repairs, computers, and staff. In addition, an independent audit will be done each year to guarantee that the funds are used only for library operations. 16. Will the Board of County Commissioners be able to redirect the library district money? No. The five elected library district board members are solely responsible for the library district funds. The elected board has the authority to contract for services, apply for grants, initiate volunteer partnership programs, and administer library operations. The new district created by the passing of the measure is an independent legal entity and none of its financial resources are available to the county. This structure is ensured by annual audits. The public funding for the library district is similar to that for the school districts or fire districts in Josephine County. 17. What about the library buildings owned by Josephine County? Nothing has been decided at this time. Currently, the nonprofit Josephine Community Libraries, Inc. has a 10-year lease with Josephine County which runs through 2020. Beyond then, the library district board and the county commissioners will need to develop a new memorandum of understanding regarding the use of the three buildings. what are the boundaries of the proposed library district? 18. Does the library district serve all of Josephine County? No. Library district proponents made two previous attempts to pass a library district that serves all residents of Josephine County, and they did not pass. Therefore, this measure reflects the will of voters and proposes to form a smaller, noncontiguous library district largely made up of just those voting precincts that surround one of the four public library branches in Grants Pass, Cave Junction, Williams, and Wolf Creek. “Noncontiguous” is the legal description for a district that is not connected as a single land area, but instead consists of islands or separate areas that receive service. 19. What precincts are served by the new library district? 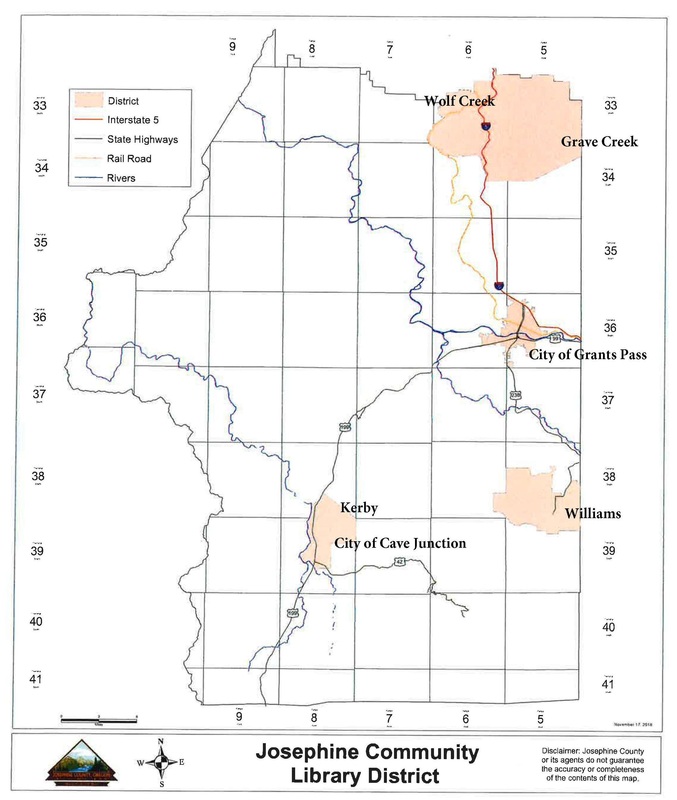 The boundaries of the noncontiguous library district include all 12 precincts in the City of Grants Pass as well as the precincts containing City of Cave Junction, Kerby, Williams, Wolf Creek, and Grave Creek. This totals 17 of the 47 precincts in Josephine County. See the Library District map. 20. Doesn’t drawing the library district this way amount to gerrymandering? Absolutely not. “Gerrymandering” is redrawing a congressional district that provides a political benefit to a specific political party. Ours is a noncontiguous library district as allowed by ORS 198.720. Noncontiguous library districts exist in other areas of Oregon and the country, and is a way to provide library services. In our case, each noncontiguous area of the district surrounds one of the branches of the public library system. 21. How can I find out whether I live within the library district boundaries? Click to go to the Library District map tool. In the upper-left corner of the screen, type your property address and press Enter. The map zooms to show your address. If your address shows in one of the colored (blue, orange, purple, or green) blocks, you live within the library district boundaries. If your address shows in a gray area, you live outside the boundaries. For more assistance, email info@josephinelibrary.org. 22. I live outside the proposed library district. How am I affected? You’re not in the boundary, so you do not pay taxes for the library district. Only those who live within the library district pay taxes for the district and are therefore don’t pay the annual library card fee for checkout privileges. Those outside the district can purchase a library card for an annual fee or volunteer a certain number of hours in exchange for a library card. Property owners outside the district can request to be added to the district. 23. I live outside the library district boundaries, but I need to use the library to check out books and other materials. What does this mean for me? Those who live outside the library district boundaries do not pay taxes for the library district, and therefore must pay an annual library card fee for book checkout privileges. 24. I live outside the library district and want to buy a library card. How much does a library card cost and how do I get one? The cost will be decided by the library district board after the district is officially formed on June 14. At that point, the board starts making decisions about policy and process. However, neighboring library districts tend to base its library card fees on what the average household would have paid in taxes had it been part of the library district. Until this decision is made, you can continue to use your old library card to check out books and other materials. 25. I live outside the library district boundaries, and I can’t afford to buy a library card every year. Can I continue to use the library? Anyone can visit and use any public library during open hours. You’ll be able to browse through the collection of books and other materials, read, connect to wireless Internet, and participate in programs. You just won’t be able to check out books or other materials. You can also volunteer a certain number of hours each year to have the library card fee waived. 26. Will children living outside the library district have to pay the annual library card fee to check out books? Because the noncontiguous library district boundaries creates an “unserved population,” it’s likely that the new library district board will initiate fundraising efforts—including grants—to be able to pay the annual library card fee for children living outside the library district. The library district board is discussing this issue in its public meetings. Public participation is encouraged. 27. Will library volunteers living outside the district have to pay the annual library card fee? The new library district will need even more volunteers than ever, so volunteers will continue to be highly valued. Volunteers living outside the district may have the annual library card fee waived in exchange for volunteering a certain number of hours per year. Current library volunteers who live outside the district will be grandfathered in and eligible for a library card for the first year of the district. 28. Can I add my property (opt in) to the library district? Yes. Any individual or group of property owners may fill out paperwork requesting that the Board of County Commissioners annex their property into the library district. After a public hearing, the county commissioners vote on the request. If the request is approved, the property owner’s tax lot(s) become part of the library district. The property does not need to be adjacent to an existing library district boundary. The district board will work with Josephine County to streamline the annexation process. It’s expected that the form and process will become available around mid-July. The special district annexation process is governed by ORS 198.850 through 198.869. 29. How much does it cost? The rate for the Josephine Community Library District is 39 cents per $1,000 of assessed property value for owners within the boundaries of the library district. This rate means that the owner of a house assessed at $200,000 would pay $78 per year, or $6.50 per month. This tax will begin to be assessed starting July 2017, and the library district will start to receive tax receipts in November 2017. 30. How does this 39-cent rate compare with other library districts in Oregon? This would be one of the lowest rates in the state. Four other districts have rates at 25 and 29 cents, and one other district is at 37 cents. Hood River County also has a 39-cent rate, but it has one-third the population of Josephine County. Neighboring counties with library districts include Jackson, Curry and Coos. Curry County has five independent library districts in different communities, operating at 66 cents. Coos County has a countywide library district run by a combination of county and city governments, at 73 cents per $1,000 assessed value. Voters in Jackson County agreed to form a library district in May 2014 at a 60-cent rate. 31. Now that the library is receiving tax funding, why are you still fundraising? The new library district doesn’t start receiving tax receipts until November 2017. Therefore, to help the new district start out healthy and without debt, the nonprofit Josephine Community Libraries, Inc. conducted the spring fundraising drive. This is also helping ensure uninterrupted library services in a transition that appears seamless to library users. 32. Can I still donate to my library? Yes, indeed! Donations are needed to keep library services and programs running uninterrupted until tax receipts start being received in November. Click for ways to donate to the library. 33. Can I keep making my automatic monthly contributions to the library? Yes, please do! As part of the transition from Josephine Community Libraries, Inc. to Josephine Community Library District, there might be an account change in a few months. You’ll be notified well in advance. Click to start making automatic monthly contributions. 34. How can I learn more about the new Josephine Community Library District? Browse the library district web area. Click to read the Josephine Community Library District Economic Feasibility Statement (pdf, 591kb). If you don’t see your question here or want more details, email info@josephinelibrary.org. 35. How can I help? Volunteer at your local branch. Library volunteers do everything from cataloging and shelving books and providing information to library users, to hosting children’s storytimes and checking books in and out. Volunteers also provide behind-the-scenes expertise, including marketing, communications, fundraising, outreach, facilities maintenance, and more. As more library hours are added, many more volunteers will be needed for all jobs. Click to learn more. Donate to your library. The new library district doesn’t start receiving tax receipts until November 2017. Therefore, donations will help the new district start out healthy and without debt, and will also ensure uninterrupted library services in a transition that appears seamless to library users. Click to learn how to donate to the library.